They say you should never judge a man until you’ve walked a hundred miles in his shoes. Well, we hate to break it to you but a man will often be judged solely on his shoes, regardless of the mileage or personal sob story behind them. It’s a cruel, cruel world and unfortunately a shining personality just won’t gloss over a terrible pair of trainers – not now, not ever. And don’t even get us started on Crocs. With that in mind, summer is just around the corner and the time for a fresh pair of treads is nigh. Enter FashionBeans’ new ‘Limited Editions’ series: showcasing all the – you guessed it – limited editions and designer collaborations that should be on your radar, along with the key release dates, for the month ahead. These items are always in high demand, often selling out online within hours – just ask anyone who tried to get their hands on the Nike x Pigalle Air Force 1s last weekend – so we’re here to give you a head start in the race to own some of menswear’s most sought-after pieces. Today we focus on five limited edition collaborative trainers that are set to launch in May. From sports luxe heavyweights Saucony and Nike to high-end retailers END and Liberty London, designer collabs are big business and it’s easy to see why. Exclusivity, kudos and innovative design – there’s plenty of reasons why sneakerheads the world over clamour for these one-of-a-kind creations. Those that say trainers have no place in a capsule wardrobe should cast their eyes over the Brooklyn We Go Hard (BWGH) x Puma Darkshadow Pack. Puma’s clean, minimal XS-850 and XS-698 silhouettes have been reworked in monochrome tones, producing two versatile and completely timeless pairs of kicks. However, even though the palette is restrained, a subtle and refined statement is achieved through the combination of premium materials and textures, with a nubuck and on trend mesh upper finished with chenille side stripe detailing. Nike and Adidas dominate the trainer market and, more often than not, Puma takes a back seat. But the fashion tides are always changing. If this most recent collaboration is anything to go by, we can expect big things from the revitalised brand and investing in something unique is always a strong sartorial move. The Darkshadow Pack is available to pre-order on the 1st of May from the BWGH website and will go on general sale at selected retailers later this summer. The trainers are actually part of a wider collaborative activewear collection, which includes performance tees, sweaters, jackets, sweatpants and even a blazer – the epitome of sports luxe. General Release: Selected retailers, late summer 2014. Without question, the runner has become THE key trainer silhouette over the past couple of years, leading to the resurgence of long-forgotten, specialist brands such as New Balance, ASICS and Saucony. Combining the food industry’s growing trend for gourmet burger joints with their own love of a good burger, premium boutique END. has teamed up with Saucony on the Shadow 5000 ‘Burger’ trainer. Due to be released on the 1st of May, don’t be put off by the combination of green, red, orange and pink – colour-pop footwear is a major trend for SS14 and the muted shades utilised are both summer-appropriate and actually quite understated. Crafted from top quality materials, the upper features perforated nubuck and suede with touches of leather, along with dual-branded insoles and a woven tongue label. They come in custom shoe boxes that take inspiration from traditional burger packaging and, continuing the fast food theme, additional laces are packaged in corresponding branded sauce sachets, allowing you to “top off” these limited editions however you like. We recommend going sockless with slim-fit jeans (roll up the cuffs a couple of times), a plain tee and minimal sweatshirt/varsity jacket for your own take on the sports luxe/Americana trend. Available in extremely limited numbers, the Saucony x END. Shadow 5000 ‘Burger’ will be released exclusively at the store’s launch party on Thursday 1st May 2014, followed by an online release on Saturday 3rd May. Quite possibly the nerdiest yet most incredible collaboration we’ve come across this season is the Gundam x Reebok Instapump Fury Pack. Reebok has ridden its ‘Classic’ trainer silhouette to new heights over recent years due to the release of innovative reworks and the nineties trending within the industry; the Instapump Fury is another product of this era and its re-release in 2014, marking the twentieth anniversary of the design, was both unexpected and welcomed in equal measure. The Instapump Fury was considered cutting edge at its time of launch due to it being the first running shoe to utilise the brand’s ‘Pump’ technology. Stepping away from conventional lacing systems, the Pump Fury contains an inflatable tongue that holds the foot in place both comfortably and securely. If you recognise Gundam then bravo, you’re as geeky as we are. If not, think Japanese anime skyscraper robots that do battle for the preservation of humanity (yep, we told you it was nerdy) that just so happen to translate beautifully into trainers. Granted, these geometric colour-pop treads aren’t for everyone, but if you’re confident enough to don patent leather and a galaxy print then you deserve big credit. Available in two striking colour ways – blue/red/yellow and red/purple/pink – the Gundam x Reebok Instapump Fury Pack will be available at selected Reebok retailers in the coming weeks, so keep your eyes peeled. General Release: May 2014 at selected retailers. 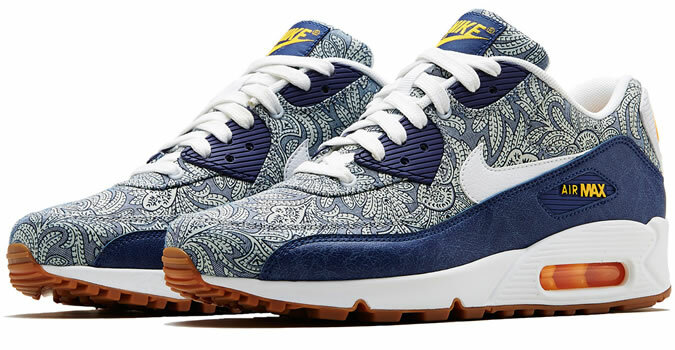 Following on from the success of previous collaborations, Nike Sportswear are continuing their partnership with premium retailer Liberty London – releasing a summer 2014 trainer collection. Six of Nike’s most popular silhouettes – the Air Max 1, Dunk Sky Hi, Internationalist, Roshe Run, Blazer and Air Max 90 – have been transformed with application of Liberty’s signature floral prints, sourced from the retailer’s extensive archive that spans back to the late 19th century. Striking without being brash or over the top, each and every one of these designs would slot seamlessly into a capsule wardrobe, allowing you to make an effortless statement when required. With colour-pop footwear and floral print key trends for SS14, there has never been a better time to invest in this well-established partnership. This season, our favourites have to be the Air Max models. Both feature a screen-printed upper with a dark blue or sand fabric trim – a combination that oozes elegance and quality. Form an orderly queue from May 7th. Pre-Release: Available now exclusively at Liberty London, Regent Street, London, W1B 5AH. General Release: Available at global Nike retailers from May 7th 2014. Price: From £75 to £120. When it comes to trainer cult hype, nothing quite surpasses that of the Riccardo Tisci x Nike Air Force One RT collection. The initial announcement back in January set the fashion world alight as two industry heavyweights came together to produce something really special. The collection was unveiled on the 1st of March and, needless to say, it certainly lived up to expectations – the range sold out within hours. Ever since, sneakerheads worldwide have been clamouring to get their hands on these beautiful treads, with many styles now fetching up to double their RRP on auction sites. Nike’s minimal Air Force 1 silhouettes – including the original lo and mid as well as a new hi-top and boot – are complemented by innovative use of colour, but rather than make a garish, Givenchy-inspired statement they merely nod to Tisci’s high fashion background. Crafted in premium and tumbled leather, as well as synthetic suede, each trainer features tribal accents, along with its own unique detailing. Nike are due to release the second part of this soon-to-be-legendary collab in May, with the new black colour ways set to be in extremely high demand. You will need to be quick if you want to pick up a pair. Available: May 2014 from selected Nike retailers and online at Nike.com. Heads Up: MR PORTER are going to be stocking the collection, so keep your eyes peeled for updates. Price: From £110 to £270. Owning a collaborative designer trainer subconsciously states you’re aware of modern trends, willing to take a risk and informed enough to cash in on limited editions before the masses move in. A foolproof formula. With Adidas’ partnership with the now almost biblical Pharrell Williams on the horizon, the collaborative concept is only set to become bigger and better going forward – stay tuned as FashionBeans continues to bring you all the latest must-own pieces over the coming months. So, what do you think of our rundown? Love them? Hate them? Any others you’d like to make fellow readers aware of?